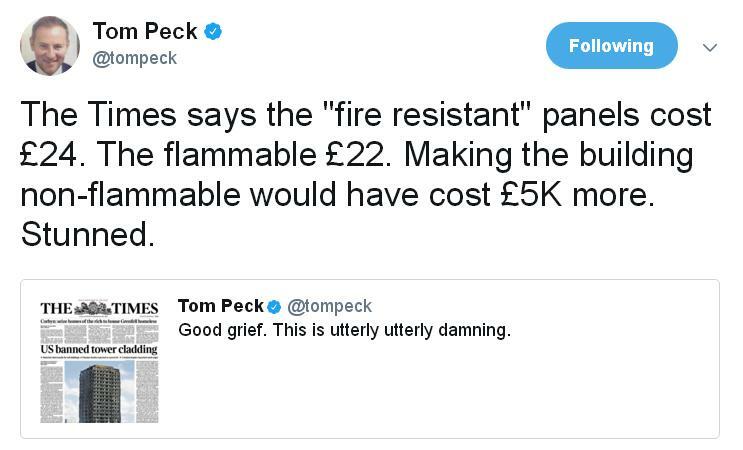 Tom Peck is a respected journalist at The Independent and the figure of £5k more that has cost by many accounts 100 lives means that the landlord Kensington & Chelsea TMO took a decision that a tenant’s life is worth £50. K&CTMO must be put under special measures immediately that can happen to social landlords in some circumstances by the Government’s housing quango and the current board must be sacked forthwith. I care not jot if this circumstance does not meet the Housing regulators criteria, it simply MUST be done. I am not going into a lengthy tirade about bad social landlords or say that all social landlords or even all TMOs are or can be bad. I don’t need to as Grenfell Tower long after it stops being on the media 24 hours a day is seismic for ALL social landlords, even the really good ones, even the best of the best. Social landlords trade on the fact they are not the unscrupulous dangerous landlords which they daily portray the nasty private landlord to be. There is much merit in that yet Grenfell Tower sees social landlords and social housing lose that perception and reputation for good. It is the old adage that it takes 20 years to build a good reputation and 5 minutes to lose it. The general public see ALL high rise tower blocks as unsafe yet they also see all social landlords in a wholly different light. The prefix ‘social’ has been increasingly waning for some time and Grenfell goes much much further and the one bad apple syndrome is applied to their perception that even social landlords can’t be trusted. It is not just other TMOs that will suffer this irreversible reputational loss it is the entire spectrum of social landlords and it matters not a jot that some social landlords are bloody good and don’t deserve – and of course there are some bad social landlords as much as the sector wants to deny it and not just the smaller TMOs but the largest housing associations. Yet I cant state often enough that facts matter not a jot, only perception counts. Today I saw a very responsible, sensible and good practice news release from Trafford Housing Trust (THT) which said that our tower blocks are not of the same (flammable / dodgy / bad) construction as at Grenfell. It was a recognition and attempt to allay fears and negative perceptions that their tenants could have and likely have. I’ve initialled that for obvious reasons and because it reads as sick and offensive in this context yet there is no better adage to describe the point. To change tack there are many actors to blame other than the individual landlord and none more so than central government and, all politics aside, the Tory government. Eight years ago on 3 July 2009 there was a horrendous fire in Camberwell at Lakanal House a 14-storey tower block in which 6 tenants lost their lives. The then Labour government ordered an Inquiry which took an offensive 4 years to hand down its report in 2013 with recommendations as all do. The Tory government have sat on that Inquiry’s finding’s ever since a further FOUR YEARS and to make that even worse the newly appointed Conservative Housing Minister has said today (Thursday) that the government are almost ready to start consultation on the issues!! That is as offensive as it gets. Why the need for consultation rather than action and actually f*cking doing something in the first place after sitting on this for four f*cking years, yet they aren’t even ready for a f*cking consultation! Prevarication upon prevarication upon not giving a flying f*ck about human life is the current Conservative government position! How many tenants does it take to die before the government acts! Or perhaps the Conservative government also believe a social tenants life is only worth £50 at most too?! GE Voting the facts and Corbyn is the bookies favourite as the next PM! Another case of saving money and putting peoples lives at risk. The cladding should all be removed ASAP. The residents didn’t want it, in the first place. There are so many issues this horrendous fire has highlighted. You have the Disabled, living at the top of these blocks. They don’t have a hope in hell, of getting out. Lifts can’t be used, obviously. Told to stay in they flats, when many could have been getting out. Lack of alarms. Lack of a sprinkling system. One stairway to serve ALL floors. No, fire extinguishers .No, smoke alarms. Then, you have when Boris was mayor. The closure of so many fire stations, and many losing their jobs All, having a knock on effect. . May couldn’t be bothered to talk to anyone., Due to security reasons. The arrogance of the woman!! Avoiding answering the questions of the people affected. .Yet the Queen. Could do so. And, Prince William. I’m sure there is so much more, yet, to surface. An enquiry ordered. How many years, will that take??? Meanwhile. Putting more people at risk….. I’m very angry. No wonder all the people involved, are also, very angry. …. HUGE thanks, must go to the Fireman. The Emergency services. The Police. They will get stop thinking about the images they saw that day…. And, all the people, who, have yet to go in and recover bodies….. Some, of which, will never be able to be identified…… Much, love to all those left behind to grieve……. High rise buildings and publicly use a blow torch on it. That will either allay or confirm fears. Nothing else will.